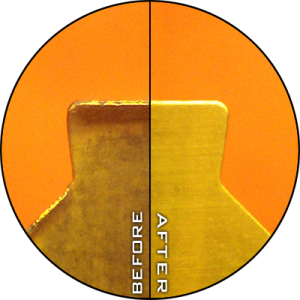 We offer complete reconditioning for carbide, ceramic, PCD and CBN products. We are also able to provide customized edge preparations and PVD coatings. Give us a try with our No Risk Guarantee, and we’ll recondition a sample of your inserts. If they don’t perform the same as brand new inserts, it won’t cost you a thing! As you can see – at about 20x magnification – the difference between used inserts and our reconditioned inserts is substantial. We use special equipment to make sure that reconditioned inserts remain within OEM specifications. Go ahead, click on the image to the right for a closer look. Our lead times are fantastic too! For uncoated product, we’ll turn them around in only five working days. For coated product, turn around happens in just ten working days. Be sure to ask about same-day service on uncoated product for emergency needs. Your inserts will arrive at your door in new distinct orange packaging with a custom label of your choice. This helps distinguish our product in comparison to your standard OEM product. 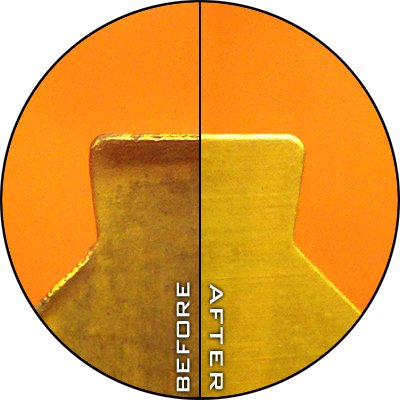 Let us show you how we can help you save up to 30% on your indexable insert and brazed tool costs! © 2019 - K&S Carbide Regrinding, Inc.